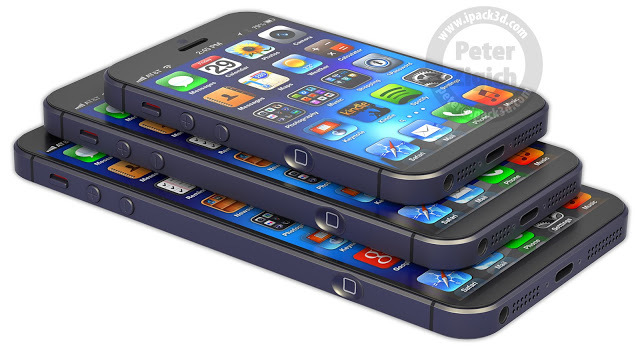 The image above shows the iPhone 5 next to Peter's fictitious iPhones: the iPhone 6 Mini, iPhone 6, & iPhone 6 XL. Peter doesn't have any info to suggest that these models exist, so they just represent his vision of what they could look like. But they are cool nonetheless. Peter is speculating that the next iPhone could end up being a trio of models, not just the single new model Apple has released each time. His models are all based on Apple keeping the existing 4" screen from the current iPhone or even making it larger. The iPhone 6 Mini, for example, is basically a current iPhone 5 with the lower fraction of an inch of bezel cut off. The iPhone 6 keeps the same dimensions as the current iPhone 5, only it has a larger screen with enough room for another row of icons. 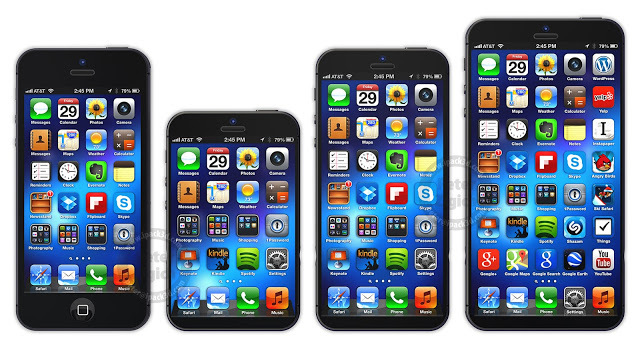 And of course the iPhone 6 XL is the rumored phablet iPhone that we are all hoping Apple is making. Peter came up with the designs by moving the home button to the sides of the new devices. That's an interesting idea, but it is also a poor design. He placed the button on the bottom half the the left and right edges. That is where everyone grips their phones, so Peter's home buttons are going to be accidentally pressed quite often. Personally, I don't think any of these are all that plausible, though the iPhone 6 Mini looks interesting. I expect Apple's new iPhones to have a screen resolution that can be expressed as a multiple of the screen resolutions on the current devices: 1x, 2x, etc. They will be want to minimize the amount of extra work they are introducing for iOS developers. Aside from the iPhone 5, this is what Apple has done in the past when they introduced the Retina Displays. I think they will keep with what works. My guess is that if Apple releases a new and larger iPhone it will have a screen resolution that matches the Retina Display on the iPad 4 (2048x1536) or it will have a screen resolution 4 times as high as the one on the current iPhone 5 (2272x1280). I won't speculate as to the size of the screen but it will pack the pixels in tighter than anyone can see.